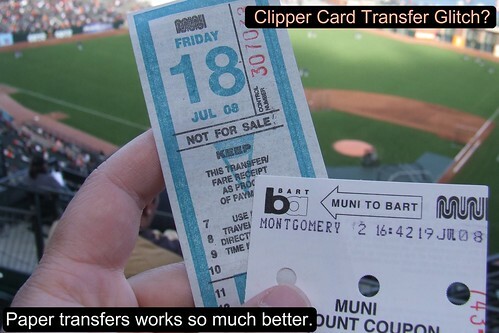 Fellow blogger, John Murphy, posted a blog entry asking people to guess correctly how much he paid with his Clipper card when he took Muni and BART. The prize for the first correct answer was some micro-brewed beer. Rode a Muni bus to the 24th Street BART station. Transferred to BART to exit in downtown SF. The second Muni ride is free because the transfer is valid from the time issued from the first ride. Why did he get charged an extra $1.75? John did use the same Clipper card and transferred to his second Muni bus within 90 minutes of tagging his card on the first Muni bus, but was overcharged, which doesn't make a lot of sense. What happened is he did receive an e-transfer from his first ride on Muni, but when he took BART, his e-Muni transfer was wiped off and the "BART to Muni" transfer was encoded; this meant that instead of a free ride utilizing the e-Muni transfer, he was charged $1.75 by using the other e-transfer. This can also happen on other agencies, such as taking BART and AC Transit. An AC Transit passenger could use their Clipper card to pay e-cash for their ride to BART, take BART, and transfer to another AC Transit vehicle to get to their destination. AC Transit's transfer policy is that transferring to another AC Transit bus is just 25 cents, but if the passenger took BART, the 25 cent offer gets wiped off and the passenger instead pays $1.75 to AC Transit. The easiest solution is for passengers to carry a second Clipper card or pay with cash for some of the rides, but I think this is just a waste of plastic and the need to think creatively to get around the system. Let's ask the folks at MTC, Clipper, and Cubic. I'm waiting for an answer. Leave a comment. You're correct - you should not have been charged for the second ride. This was an incorrect implementation of Muni's transfer policy and MTC has been working with our contractor to fix the issue. We encourage customers to access their online transaction history records to determine if they were overcharged for this transfer trip. Customers who are affected by this issue should contact Clipper Customer Service to request a refund for the $1.75 that they were overcharged. I can't believe they publicly admitted to a mistake. That's rare. Before Clipper, those of us who ride BART to Daly City could get a paper transfer, before exiting the faregates, which would allow us a free MUNI 28-bus ride to and from the SFSU campus. Clipper card has made this much more difficult because it only gives a free transfer if I ride the 28 MUNI both to and from Daly City BART and do so within an hour of exiting the faregates. If I ride the free SFSU shuttle TO campus from Daly City BART, Clipper card will not give me a free ride on the 28 bus FROM campus back to DC BART. The simple solution for this is for me to pick up paper transfers and continue to use them, rather than my Clipper card, but it seems a violation of the spirit of the transfer and it will not encourage adoption of the Clipper card by SFSU students. Hello, I think the reason is that a transfer is expected to be used as a literal "transfer" from one line to another within a given time period, not a generalized "free ride" within a given time period. Since he did not transfer between two muni lines but rather took two separate muni trips, the first transfer did not stick. I agree that this is silly, but I think that's the reasoning behind it. Transfers have never officially been intended as "free ride for 90 mins" but of course that is how they are used. Anon - I was taking one trip, one leg of which was on BART. BART alone couldn't cut it, and MUNI alone would have been so much much more painful - NextBus was telling me 54 minutes to the next 27 Bryant. Regardless - there was no "reasoning" done here. MTC/MUNI/BART/Cubic/whomever did not determine that this was the "correct" way to do it and implement it that way. They just lazily implemented the system which produced this result. Wow John got an answer? I'm impressed. I actually noticed this exact same problem several weeks ago (I've had to take Muni->BART->Muni due to munifail in the subway) and wrote Clipper Customer Service asking for an explanation and refund. I sent that message on May 23 and have yet to receive a response. I'm curious how many people they have ripped off with this flaw and what they are planning on doing to make it right. (hah!) It's not as though most riders are checking their transaction records regularly and noting discrepancies like this. I guess you have to harass Clipper in public for them to give a darn. Sadly, I am not surprised at this. In the FIFTEEN years of testing and inter agency negotiations did no one envision such trips? i had the same thing happen but worse going from bart to caltrain. Took bart from sfo to millbrae, then jumped on caltrain going to mountain view. i had $16.45 at millbrae by the time i got caltrain and tag my pass at mountain view i was -$4.50 or something. so what should have been a $5 or so ride cost a fortune. the good news is i called up the clipper customer service line and after a brief chat with one of the operators i was given a refund. Time to Dismantle the SFMTA?